I love a good Hamburger. Who doesn’t? 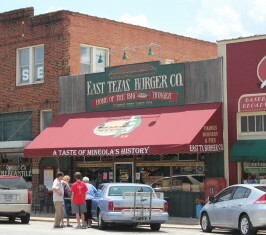 Recently Tastes Like Travel found the East Texas Burger Company in Mineola Texas. The sign on the awning says “Famous Burgers and Pies”. With a boast like that it was a must try Hamburger Restaurant . It was Sunday afternoon around 2 p.m., well after the rush. There were several people milling outside the Hamburger Joint. Upon entering there were 6 people in line in front of us and the place was full of people waiting to experience a good hamburger. We took our place in line and started looking at the menu. There were lots of choices….Lots! 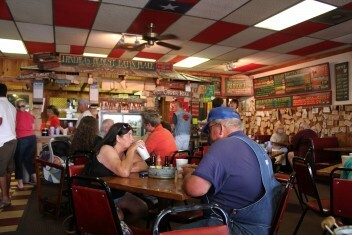 This was the home of the Big Bass Burger, home made fried pies, and a house brand of Hot Sauce. In order to compare I choose the Cheese Burger with Waffle Fries and my wife ordered the Single Hamburger. Then the wait began. One of the best things about a burger is that it is easy to prepare and does not take long to cook. However, at the East Texas Burger Company, it takes time…. a long time, or at least it did this time. We waited over 25 minutes for a taste of their Famous Burger. 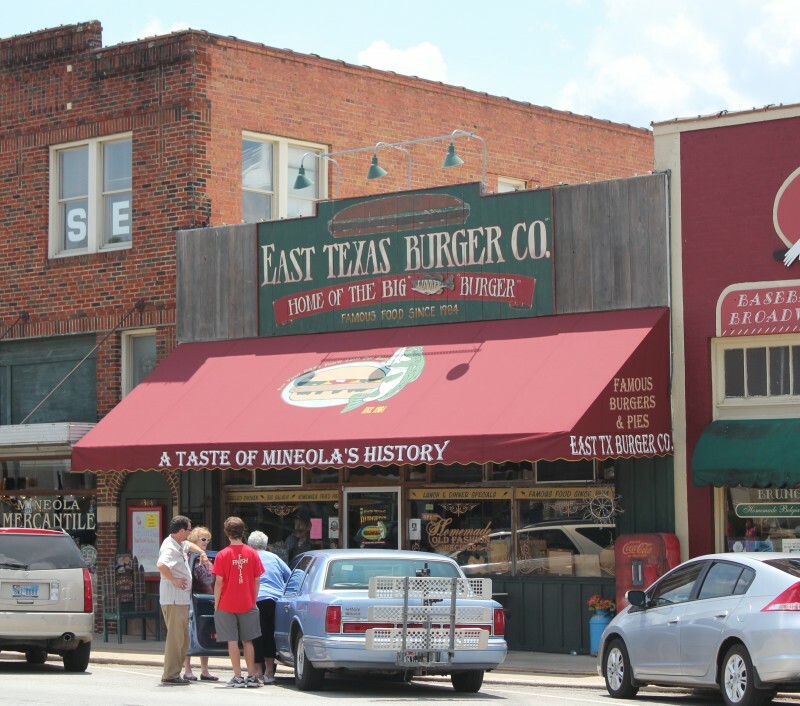 As I looked around everyone waited an inordinate amount of time at this Mineola Burger Joint. A good burger is worth the wait so when our food arrived I was ready to taste a famous burger. My ideal Cheese Burger is Meat, Cheese, Lettuce, Tomato, Pickle and Mayonnaise. As a purest when it says Mayonnaise on the menu is means Mayonnaise. At this Hamburger Joint Mayonnaise means Miracle Whip. Strike one. There is a big difference in Mayonnaise and Miracle Whip. One is not the other. I thought it would be a good idea to try their house brand of hot sauce to help disguise the Miracle Whip. There were no bottles on our table so I went to the counter to ask for some only to be told that I had to buy a bottle as they did not allow you to try it before you but it. I wonder if it is good? The waffle fries were good but it was a very small order for the price. My wife’s order was not correct but she opted to eat it as opposed to waiting another 25 minutes for the corrected hamburger. Overall it was not the Famous Hamburger I was expecting. The burger was mediocre and the service was lacking. It did seem to a popular place so maybe my tastes in Hamburger Joints is not the norm. It is my tastes however and this was not one of our favorites.